This mythical beast was a very large canine about the same size as a large calf. 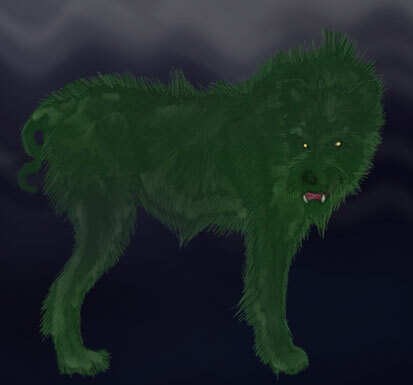 This enormous hound was covered with dark green shaggy fur and had a braided or curled tail. The green color seems to relate to the green clothing known to be worn by the fairies. Just as the Grim Reaper, this mystic beast was feared as being the messenger of death, appearing only to take one over to the afterlife. This mythical creature was capable of hunting silently, sometimes letting out three consecutive, extremely loud barks. These could be heard from very far away – even by sailors on ships out at sea. This particular warning meant that all husbands needed to quickly hide and lock up their wives. Wives were vulnerable to being abducted by this monstrous green dog. He would carry them off to fairy mounds where they were milked to feed the fairy children. If you feel like watching a majestic mythical beast in action - check out Fenrir in battle! Awesome preview gameplay provided by iGamrgeekTV.